In 2009, Midwest Craft Connection began as a hobby website for crafters to sell their handmade crafts online. Our focus was to offer gift-quality crafts that were 'Made in the USA'. Until recently, there was no way for craft vendors to enter their own information so we had to list products for them. Soon, we were inundated with so many requests to add crafts that we could not keep up. So, we updated our website and added functionality to give craft vendors the ability to add and maintain their own crafts. A funny thing happened ... we began getting more phone calls asking 'Where is Midwest Craft Connection?'. And, in January (2014), we noticed that our website generated over 2.2 Million hits! With such website popularity, we decided to open up an actual retail store. Craft vendors can still sell and manage crafts on our website but, now, we have an extra opportunity that allows craft vendors to (also) sell crafts in our new gifts and crafts store in Independence, Iowa. Our main goal remains the same ... We want to help all American Crafters start successful businesses. We want to enable you to make your crafts and earn a living by doing something you are passionate about and truly enjoy. We offer crafters an ability to sell original crafts and other craft items online. We know that it's much easier to start up a small business with help! And, we believe that it really is possible to earn a living doing what you love! We want to become a crafting resource for everyone - craft vendors, craft show organizers, and gift-shoppers. We want to fill our website with unique, hard-to-find specialty gift-craft items that are 'made in the USA', as well as, offer useful information on craft shows, craft fairs, crafting classes and other events all throughout the USA. So, if you've ever dreamed about turning your hobby into a career, or just want to work from home for a little extra income, now is the perfect time to get started - and, we want to help you. You can Email Us if you are interested in having your gift-quality crafts in our new retail gift store. 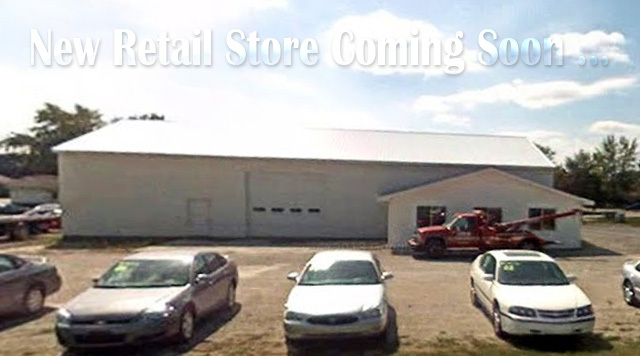 Our new retail store is shown, below. It's now being renovated but we're planning on being moved in by the Summer of 2014. This is a high-traffic main street location: 1611 First Street West, Independence, Iowa 50644. REGISTER NOW to become a vendor on the Midwest Craft Connection Website. CONTACT US to become a vendor in the Midwest Craft Connection Gifts & Crafts Store in Independence, Iowa.